Okay. I love fabric scraps. I am not sure how or when it started but it has been going on for years. And it has developed into an obsession. I go to a quilting class or a quilt retreat and I see piles of fabric scraps, many which are going to be thrown away. 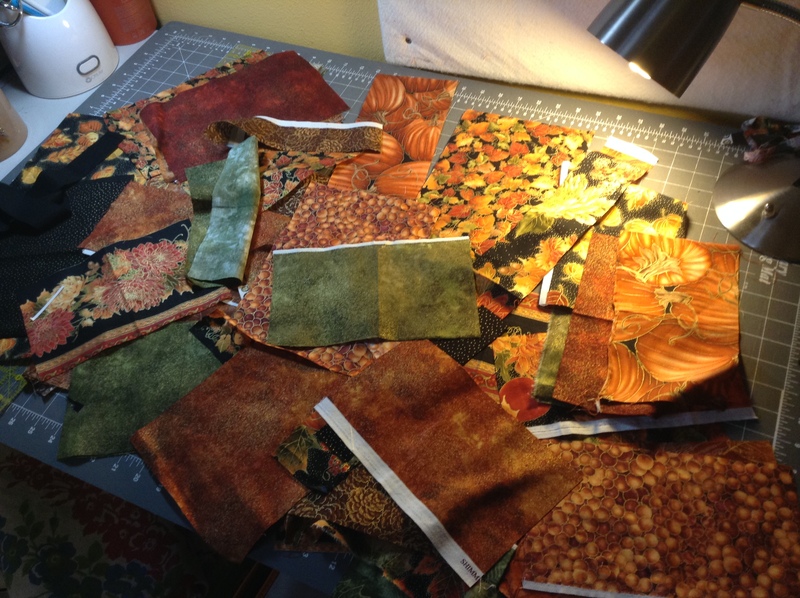 I have been guilty of staying a little late after a quilting class to “clean up” and grab the fabric scraps left behind – on the class ironing board, on the table, under the table…okay once I reached into the trash during a quilting class (when no one was looking) to rescue a large beautiful discarded scrap! A local quilt shop sells bags of high quality scraps and I have bought several over the years. There is something exciting about a new bag of scraps – the discovery – opening up the bag and seeing what goodies are inside! When visiting friends in Seattle during an annual quilting trip, we stop by a quilt shop that allows customers to fill up a sandwich bag (yes the small one) with scraps for $3. I see it as the “challenge of the century” each time. I have mastered rolling up scraps tightly and cramming them into the tiny bag. My friends are usually amazed when I empty the bag later and see how many fabric scraps I fit in! My quilting friends support my fabric scrap obsession. A dear friend and original quilting mentor, Judy, sent me over the holidays a lovely package of scraps from a recent quilt she finished. I do make quilts with the scraps, though my husband says it will take roughly 25 quilts to use up my scraps. Today I pondered: “why do I love fabric scraps so much?” The high quality quilting fabric scraps that I am attracted are from quilts others make. I guess that using other quilters’ scraps in a quilt (or just having them in my quilt room!) connects me to other quilters and the quilts they make. Quilts are pretty special thing and I love thinking that my fabric scraps are part of handmade items making someone, somewhere smile. Previous postThe End(s) Is Near! I love how she has a video on taking a shirt down to its buttons!